Overall the 2019 AAOS Annual Meeting was a great success in Las Vegas, Nevada. As an Arthroplasty Surgeon, I focused my time on the hip and knee reconstruction sections and I still was unable to see many of the available offerings. There were a tremendous number of clinical papers, scientific exhibits, instructional course lectures and posters (double the number this year, as posters rotated after two days of the meeting). The exhibitors were out in full force with their latest products, a large emphasis was placed on computer navigation, targeting devices, robotic surgery and imageless guidance systems. While all forms of presentation were different, there did seem to be a few common themes, including: opioid use/protocols to limit over-prescribing for hip and knee arthroplasty, spine-pelvis interaction and implications with component placement, infection detection, and goals/techniques to optimize patient outcomes, particularly in the short-stay arena. Hip or knee joint replacement surgery is considered the last line of treatment for joint pain. For some people, it’s the only way to alleviate arthritis-related pain that significantly affects daily activities, such as walking up and down stairs, putting on shoes and socks, and getting in and out of a car. If you find yourself unable to perform simple tasks after trying more conservative treatments, it may be time to consider a joint replacement. To determine if you’re a candidate, most doctors will consider how much you can gain by undergoing the procedure. Your doctor will review your medical history and x-ray the affected joint. If your symptoms are severe and correspond with what is found on the x-ray, your doctor will likely recommend the surgery. The 11th Congress of Chinese Association of Orthopaedic Surgeons (CAOS) in Hangzhou, China featured a co-branded program with AAHKS with Richard H. Rothman, MD, PhD and Yan Wang, MD serving as Chairs and Quoqiang Zhang serving as Executive Chair. The program included numerous American and Chinese surgeons discussing a wide array of topics in both a lecture and small panel question and answer format. Specific lectures addressed management of dysplastic hips, perioperative optimization of patients, femoral and acetabular revision principles, biomaterial properties of acetabular components and practice management pearls. The program appeared to be a great success with outstanding discussions amongst the moderators, panel members and attendees. 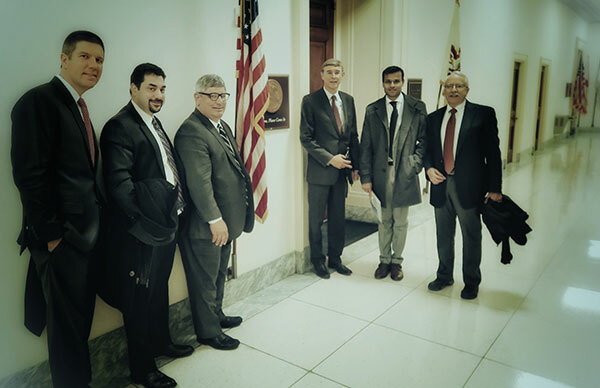 The day was filled with stimulating discussions featuring differing opinions amongst the CAOS and AAHKS members. Significant attention was focused on bearing surfaces for total hip arthroplasty, single vs. two-stage procedures for infection and overall management of bony defects in revision hip and knee arthroplasty. It was a wonderful collaboration between the two organizations that culminated in a high-tech opening ceremony, followed by a night out in Hangzhou to witness the Impression West Lake Show. 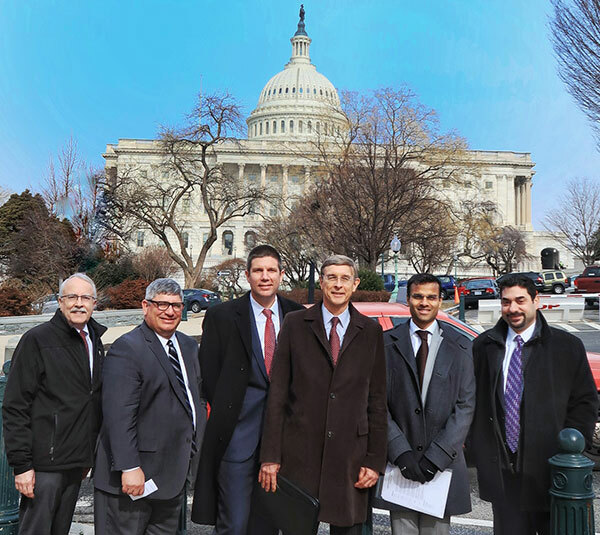 Dr. Levine joins members of AAHKS on Capitol Hill to lobby for a clarification of the outpatient designation for total knee replacements. New research from the Departments of Orthopaedic Surgery and Anesthesiology at Rush University Medical Center in Chicago set out to compare aspirin, rivaroxaban, and warfarin in preventing venous thromboembolism (VTE) after primary total joint arthroplasty (TJA). The work, presented at the recent meeting of The American Academy of Orthopaedic Surgeons, was a retrospective review of 1,361 patients who underwent primary total hip or knee arthroplasty at Rush. CEMENTLESS KNEE TECHNOLOGY: HOLD OFF? A research team including Dr. Brett R Levine, a joint replacement specialist at Midwest Orthopaedics at Rush, recently presented a study to compare patient-reported outcomes and complications in patients with cemented and cementless techniques at the annual meeting of the American Academy of Orthopaedic Surgeons. The scientists utilized data on 70 cementless knees and cemented controls matched on age, body mass index, medical comorbidities, and implant design. According to their presentation, the authors found a 30% total complication rate in the cementless fixation group and 7% in the cemented fixation group. For the full Orthopedics This Week article and complete list of researchers, click here. The overall mission for the Generation Next leadership group includes a variety of important goals. Orthopedics Today, in conjunction with the selection committee, will continue to recognize promising young surgeons and their accomplishments. The Hospital for Special Surgery in New York has been named by U.S. News & World Report as the top-ranked hospital for orthopedic medicine in the country. Dr. Levine selected into the Joint Reconstruction "Generation Next." Orthopedics Today and DePuy Synthes Joint Reconstruction recognized promising surgeons in the field of total joint replacement yesterday here at the American Academy of Orthopaedic. Dr. Brett Levine, an orthopedic surgeon at Midwest Orthopaedics at Rush, talks about using Pilates as a rehab tool in this Naperville Sun/Aurora Beacon News story about a young dancer who recently recovered from an ACL injury. After conducting research on 40 patients who use Pilates as a form of rehabilitation following joint replacement surgery, Dr. Brett Levine, orthopedic surgeon at Midwest Orthopaedics at Rush, has co-authored the book, Pilates for Hip and Knee Syndromes and Arthroplasties. Seventy percent of the patients were extremely satisfied with their outcome after using Pilates. Dr. Levine believes Pilates is an excellent form of exercise post-surgically and pre-surgically because it is low-impact and strengthens the core, improves range of motion of joints and studies show it quickens recuperation time after injury. Dr. Brett Levine, hip and knee reconstruction and replacement specialist at Midwest Orthopaedics at Rush, was recently featured in an interview discussing the future of the hip and knee reconstruction and replacement specialty. Dr. Levine describes all aspects of the specialty from current studies and advancements to the challenges surgeons within the specialty face. Dr. Brett Levine, hip and knee reconstruction and replacement specialist at Midwest Orthopaedics at Rush, recently coauthored Pilates for Hip and Knee Syndromes and Arthroplasties. The book provides readers with foundational guidelines and protocols for the use of Pilates in increasing strength, balance, flexibility, and range of motion for both pre- and postoperative knee and hip patients. MOR physicians Dr. Brett Levine, joint replacement and reconstruction, and Dr. Johnny Lin, foot and ankle, were inducted as Fellows of the American Academy of Orthopaedic Surgeons (AAOS) on March 10, 2010. The inductions took place during ceremonies at the academy’s 2010 Annual Meeting in New Orleans, LA.